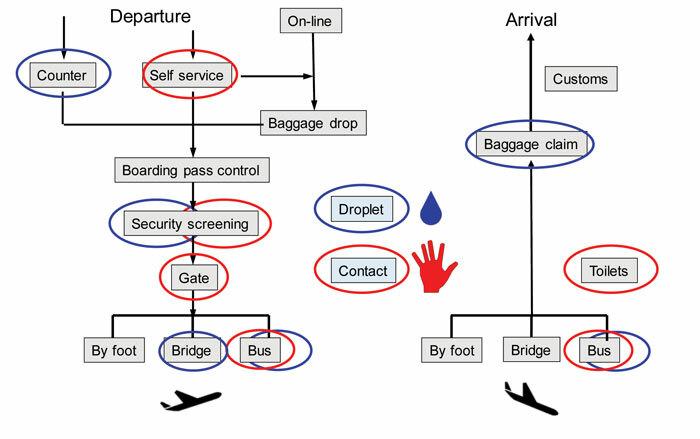 Air travel plays a significant role in the spread of infectious diseases. The continuous growth of global travel facilitates the quick and sometimes uncontrollable spread of naturally, or intentionally released, person-to-person transmissible pathogens around the world. Airports contribute to the potential spread of disease owing to the high number of passengers from across the world coming together in enclosed spaces, with high contact rates and several hand touch surfaces. 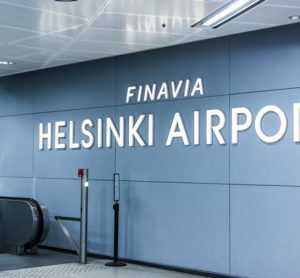 Principal Scientist at the VTT Technical Research Centre of Finland, Ilpo Kulmala, provides an overview of the EU-funded PANDHUB project, which aims to minimise the transmission of infectious diseases in transport hubs. Globalisation and the continuing growth of air travel will significantly influence the spread of infectious diseases. In 2015 there were around 3.4 billion passengers, of which 44% were international. 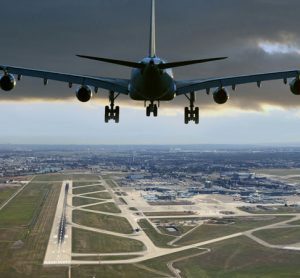 Aviation transport is expected to increase in the future at a rate of approximately 5% annually, which means that the number of passengers will double within 15 years. At airports infected people can spread pathogens exposing other passengers, visitors, and airport staff to infectious microbes. Therefore, infectious disease transmission is a significant and growing concern during air travel and at airports. A literature review revealed that there are no reported cases of potentially pandemic diseases transmitted at airports. 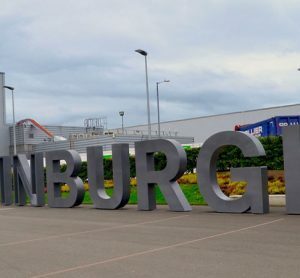 The paucity of published data that transmission occurs in transport hubs may in part be due to the rapid dispersal of travellers from such locations, hence an inability to identify the hub as the place where the transmission event occurred. Despite this, it is important that precautions are taken to protect the safety of passengers and staff within transport hubs, because these are crowded environments with transient occupants from different parts of the world who may have different susceptibilities. For efficient prevention and mitigation measures, it is important to know how germs can spread in a transport hub environment. Infectious diseases that cause serious health problems are transmitted in different ways, but the typical modes in the airport environment are inhalation of infectious aerosols (airborne); droplet transmission; and direct and indirect contact transmission. Examples of possible infectious diseases and their characteristics are shown in Table 1. Respiratory infections can be spread when an infected person sneezes or coughs emitting a droplet spray of saliva and mucus. The pathogen containing droplets are propelled a short distance (up to one metre) through the air and expose nearby persons. Droplet transmission occurs when the pathogen-laden particles travel directly from the respiratory tract of an infected individual to mucosal surfaces (in the eyes, nose, mouth and respiratory tract) of a susceptible person. The large droplets can also land on surfaces and contribute to indirect contact transmission. The airborne transmission is caused by the inhalation of small respirable size aerosols. These aerosols may contain infectious agents that can reach deeper places in the lungs, potentially initiating infection. Owing to the fact that the smallest aerosols are more concentrated nearer their source, they are more likely to transmit over short distances than long. Many respiratory diseases have been found to have higher transmission rates when susceptible individuals are in close proximity to the infectious person: up to 1-2m. Within this short range, the susceptible person has a substantially greater exposure from the directed respiratory spray, consisting of both inspirable large droplets and respirable aerosols, thus maximising inhalation exposure to small particles and inspirable droplets. The time dependent exposure of nearby persons is illustrated in Figure 1. 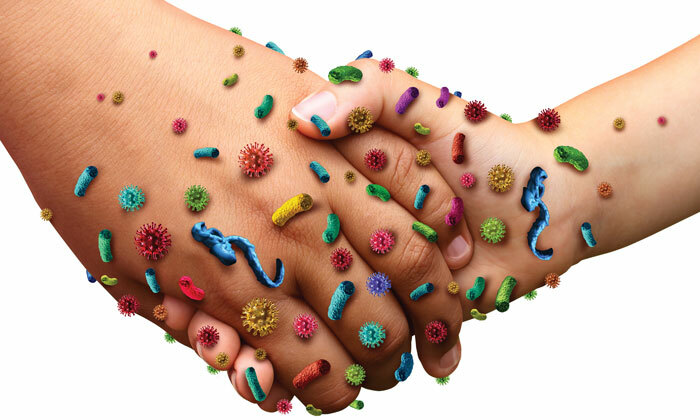 Direct contact transmission can occur when germs are transferred from an infected person to a healthy person via direct physical contact with blood or body fluids. Indirect contact transmission occurs usually by first touching a contaminated surface and then mucosal surfaces of the eyes, nose or mouth. Hard surfaces are major contributors to disease transmission since the transfer efficiencies of microbes from hard and smooth surfaces to hands are much higher than from soft surfaces. Depending on the virus or bacterium, survival time may vary on the skin of hands – e.g. influenza A – for up to 15 minutes and norovirus up to several hours. It has been observed that people in public transport environments touch their faces an average of 3.6 times per hour, and common objects an average of 3.3 times per hour. This rate of self-touching means that people are likely to get germs on their hands far more frequently than they wash them off. Furthermore, many of the microbes survive long enough to allow transmission. Hot spots are points or sites within a traffic hub environment where the risk of disease transmission is at least transiently increased due to favourable conditions for transmission, or by human behaviour. 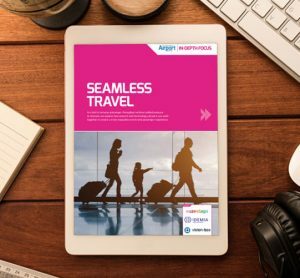 They occur along the passenger journey as hubs contain a number of different micro-environments with varying and fluctuating occupancy levels. Depending on the specific properties of a microbe, the potential sites for hot spots within a hub will vary in accordance with the microbe. For example, potential influenza hot spots (at least periodically) are formed by a high density of passengers, as well as frequently touched surfaces. Figure 2 shows the identified hot spots for droplet and indirect contact transmission at an airport. The differences in passenger density and the time or speed of passenger flow between the different hub types will affect both the intensity and the duration of exposure, particularly for droplet transmission. The hot spots for droplet and aerosol transmission are related to places where the passenger density is over 1.5 people per m2. Such crowding at airports may occur in entrance halls near ticketing kiosks, check-in counters, queues for security check and border control, and in gate areas when boarding the aircraft. The most potentially ‘hot’ spots for indirect contact transmission are surfaces frequently touched by passengers, such as touchscreens of self-service automats; bins for carry-on items at security checkpoints; luggage trolley handles; handrails and lavatories; and the passport control self-service automats. 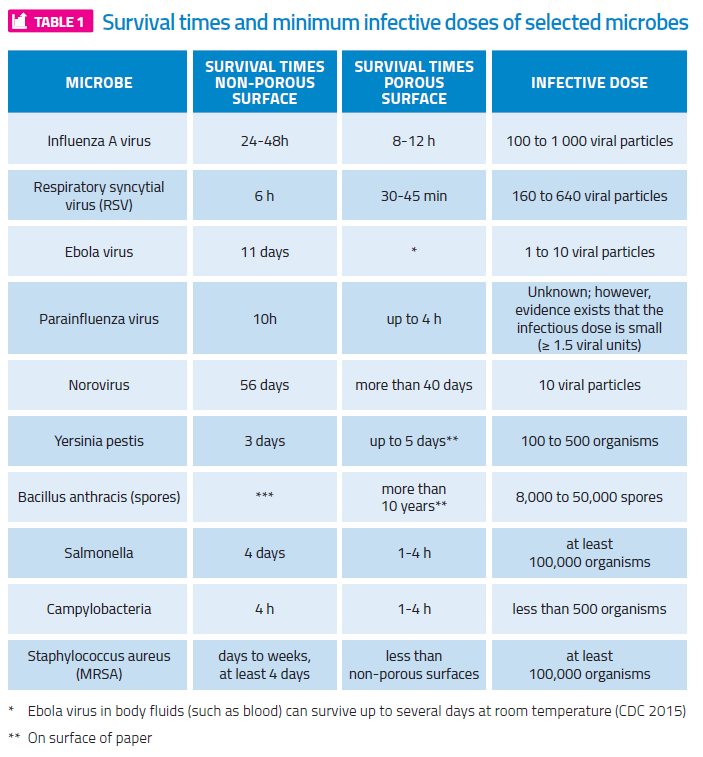 In general, viruses and bacteria survive longer on non-porous, water resistant surfaces, such as stainless steel and plastics, than on porous surfaces, such as fabrics and tissues: exemplary survival times are presented in Table 1. In addition to the surface type, temperature and relative humidity have a significant effect on the survival rate on surfaces. The ventilation system of transport hubs may contribute to the spread of naturally occurring or intentionally spread pathogens. How effectively this happens depends on the characteristics of the HVAC system, such as air distribution, flow rates and filtration efficiency as well as the ventilated spaces. In general, confined and crowded spaces with inadequate ventilation increase the risk of airborne infection. Measures to reduce indirect contact transmission (administrative and personal control). 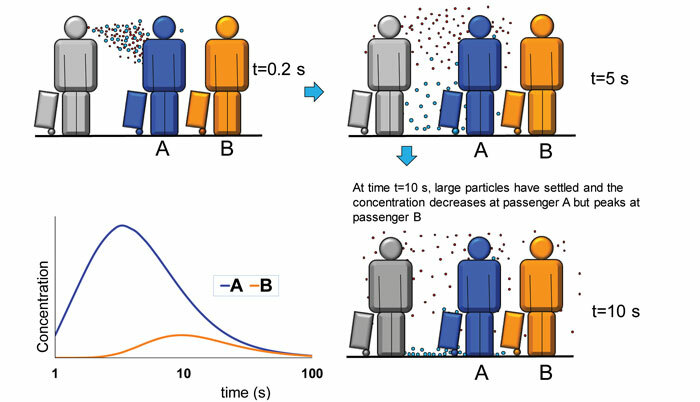 Since passengers themselves play an important role in the spread of infectious diseases, their behaviour is critical in controlling the spread. In order to prevent germs from spreading to others, passengers should cover their mouths and noses with a tissue when they cough or sneeze, or cough into their elbow if tissue is not available. The contact transmission route can be cut by maintaining good hand hygiene and avoiding touching one’s face (eyes, nose or mouth). The risk for droplet and airborne transmission can be reduced by avoiding crowds and close contact with other passengers and staff members. The infection prevention principles will be used in the PANDHUB project as a framework for developing infection control guidance in the form of simple, practical, operational infection control recommendations and guidance for transport hub operators and employees, and practical guidance for passengers, which are proportional to risk. The guidance will capture the key infection control principles to facilitate a uniform, rational, proportionate approach, based on evidence where this exists. In summary, it can be concluded that under normal situations the risk of getting a serious disease in a hub airports is low. However, to prepare for pandemics or high threat pathogen incidents it is important that proper precautions are taken to protect the safety of passengers and staff. DR ILPO KULMALA is a Principal Scientist at VTT. 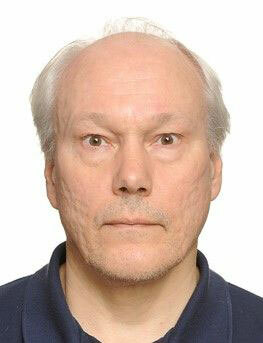 He has over 30 years’ experience in the field of ventilation and contamination control. He is currently the coordinator of the EU funded PANDHUB project aimed at prevention and management of pandemics and high threat pathogen incidents in transport hubs.